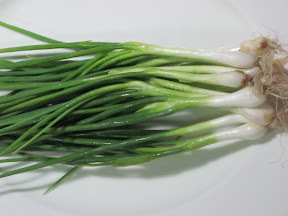 Like onion, which is found in all the food cultures, spring onion also found in many many dishes in Thai cooking, except Curry. I love them added with Coriander to garnish the Laab or being sprinkled over the noodle soups or other dishes. We eat them fresh as vegetable or cook them with the meat/fish/chicken etc. In Thailand’s rainy and winter season, when we have so much of them cheaply in the market, we sour pickle them with cabbages. Not only we love eating their young white little head and the green tube leave, when they bear flower we also use their flower for cooking. The flower comes in winter season and we usually cook or steam them with the fish.